Many Windows 7 users will be looking for quick options to upgrade to new Windows 8 operating system. Microsoft is slowly revealing details on various upgrade options from Windows 7 to Windows 8 OS. Windows 7 users need not worry about technical specifications as they are fit candidate for Windows 8 upgrade. However, one can still check to confirm: if I can install windows 8 on existing PC. Packing lot of new features in Windows 8 OS, upgrade is worthy for Windows 7 users. Microsoft has launched Windows Upgrade offer for users who buy Windows 7 PC between June 02, 2012 and January 31, 2013 dates. Then you become eligible for Windows 7 to Windows 8 Pro upgrade for discounted promotional price of $15 only. This upgrade offer is available in 131 countries with over 37 languages supported. Note: the last day to register and order your Windows 8 upgrade is February 28, 2013. 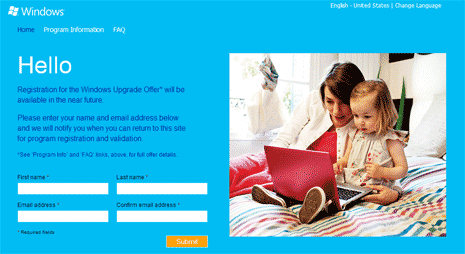 You need to goto Windows Upgrade offer website for registration. As of now, you may leave your name and email ID to get alert when registration opens for the upgrade offer. – Windows 8 media DVD is available at additional price. – Only Windows 8 Professional version is available for download. – Windows Media Center is not in upgrade [can buy separately]. – For playing DVDs you need to buy Windows Media Center or install third party software for DVDs on Windows 8 computer. Older users with Windows 7 operating system may also want to upgrade rather than purchase retail copy of Windows 8 operating system. More upgrade paths along with prices should be available soon as we head close to launch and general availability of Windows 8 OS – stay tuned for fresh updates.